Not too much mention of all those charges against him, but he reaffirms his support for sanctions against Iran. 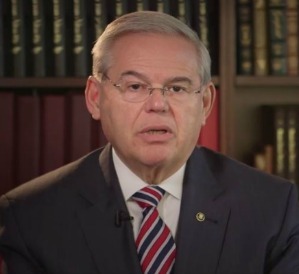 It was only yesterday that we got word that New Jersey Sen. Robert Menendez is being charged with eight counts of bribery, three counts of fraud and a count each of conspiracy, violation of the Travel Act and making a false statement. (Damn!) But today, the embattled senator has pushed out a video appeal to supporters that reminds us of his beginnings and his work in Congress. Saying at one point he had to wear a bulletproof vest because of his dedication to the fight for what’s right, much of the clip is a list of his political positions (he mentions his strong support of Israel and sanctions against Iran). Which would make this an effective campaign video. But there’s no mention really of his defense to these charges levied by the Justice Department. Coming out to say something positive is good thing. But we’re thinking Menendez would’ve done better to address these allegations head on. Perhaps he’s been advised otherwise, but then what’s the point of putting out the video? Maybe he wants to put this somehow out there in the court of public opinion? But when only 12 percent of the voting public (according to Rasmussen Reports) thinks Congress is doing a good job and you’re in Congress, public opinion is not on your side. So we’re thinking this video is only marginally successful. You?